Scotti's WebLog: ".... we're off on the road to Dewaniah... we certainly do get around..."
".... we're off on the road to Dewaniah... we certainly do get around..."
In every Arabian house, especially in the GCC region, there is a room called "Dewaniah" or "Majlis" for guests gatherings. Most of these Dewaniahs are for male visitors only. The Dewaniah is usually located close to the outside main entrance, away from the rest of the house. Women guests gather in a room inside the house and sometimes get to their gathering room from an outside entrance specifically assigned for female visitors. In some parts of the Arabian region men and women who are not directly blood related to each other or not married to each other don't mix. That's why there are often separate guest gathering rooms for both genders in the same house. In some Arabian houses this rule of gender separation is not followed. This regular gathering is a chance for relatives, friends, and invited guests to check on each other and converse in many subjects. It is a form of socializing where people communicate the latest news about other relatives, economy, business, sports, politics, etc. Tea, coffee, and sometimes a light snack are served. If you are invited to a Dewaniah, you are not expected to bring food, drinks, or gifts. Muslims pray 5 times daily where each prayer lasts for about 15 minutes: at dawn, midday, mid-afternoon, sunset, and nightfall. Prayers are usually held at the Islamic worship places called "Mosques". Regular gathering in Dewaniahs usually takes place after nightfall prayer and sometimes between the sunset and the nightfall prayers. Upon entering the house as you approach the Dewaniah notice the Dewaniah's door. If shoes and sandals were left at the door by other guests, then take off your shoes. It is customary when entering a Dewaniah or an office to greet everyone there by saying "Alsalamo-Alikom", which means "peace be with you" and it is the equivalent of saying "hello". The reply to this greeting is "Wa'alikom Alsalam". Once inside the Dewaniah, everyone will stand up to greet you and shake your hand. Start with the person standing on your right side or the one who is approaching you. If you are a first time visitor or elderly, most likely your host and the attendants will offer you a seat at the head of the Dewaniah as a sign of respect and honor. Some Dewaniahs are furnished with couches; traditional ones don't have couches and attendants sit on the floor. The floor is covered with Persian rugs and against the walls of the Dewaniah there are pillows to rest your back against. 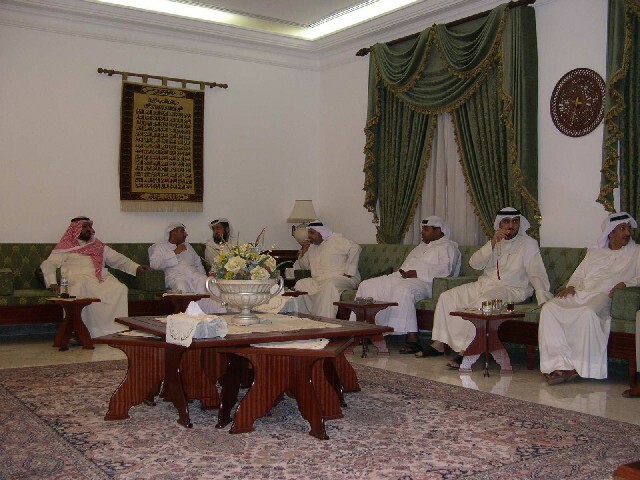 Notice that in both modern and traditional Dewaniahs, attendants are seated in a circle to ensure that no one is facing someone's else back. Also, remember the rule that the soles of your feet should not point directly toward someone else. In office or Dewaniah visits you might be offered Arabian coffee, which is served in small cups without sugar or milk. The coffee server will keep filling up your cup until you signal that you are done by slightly shaking your empty cup and either saying "Bass, Shokrann", which means "no more, thank you", or by covering the cup with the palm of your hand while returning the cup to the coffee server. Remember that you should always use your right hand. It is advisable that you accept at least one cup of coffee as a way of honoring this traditional hospitality. It's quite an honor to be invited to this thing, and all I've really done is helped the new Col. with his computer issues. It helps that I'm sitting directly across from him, and every time he gets this confused look on his face, I'm there to lead him out of his computer conundrum. Ok, that's all I've got for now, get back to your lives!